When the winds start to pulse more gently and the sun rises up from the horizon beaming its cloudless rays into Makapuu Bay.....then maybe summer is truly on its way. On Monday, King Kamehameha Day, which is a day off for most, my phone went off early with a call from Reece. She was finishing her morning beach walk and told me that the wind feels good and the numbers seem like a Makapuu morning. I had a few reports needing to be completed but decided I needed some air time too. We arrived at Makapuu, thinking that maybe before it got strong we could sneak one in. I tried kiting my new Zero, and it felt good but a little light for me. I got the Rush out, and it felt perfect. One Eye showed up and said, let's go. Reece and I balled up the gliders and headed to Crazy Man Launch with Jim. One Eye launched first, with a little wobble left and right almost matching the erratic streamers. Hmm, Reece and I pondered whether we should go, but then he made it look great in the sky and radioed down............It's smooth as butter. Reece offered to fly the Zero. On her first attempt it felt like a decent cycle, and she went toward Manics but got a little low, so she turned and beached right in front of the life guards. It's not fair, but they told her she didn't have to buy beer. She was determined to get this new fabric airborne for more than a few minutes so she hiked off the beach and back to launch. On her second attempt she was up and gone. Reece was finally flying a glider that is more in her weight range. I hope I can get that one back from her when conditions are more suitable for me to fly it. We flew almost an hour and enjoyed the sunrise colors of my new wing and the colors of Makapuu were back to their magnificent glory. All three of us landed as our tummies overruled our appetite for flying. As we drove away we caught sight of the legend Ken "Airborne" Berry pondering a launch out of Crazies. Hopefully he got one. We debriefed at lunch as Jim played along with the guitarist and sang a few songs........yes, Jim can sing and beat a rhythm on a bass box. Reece was excited to name MY new wing "Susie Sunrise". No, I don't think so. I take enough heat wearing purple! 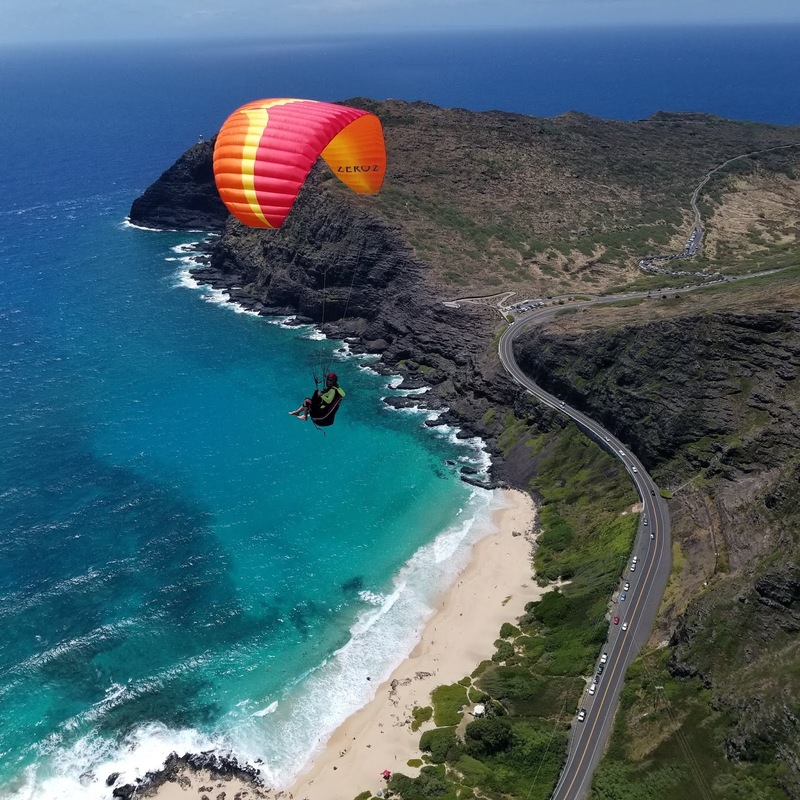 We did hear that there were oodles of flights at Kahana......but we all know Alex flies every day up there and he plays that pied piper pipe to lure all the potential wingmen (and women) that he can. Summer is here, It's Time to Fly, Get your Gear, if you can get it back, and Go!!!!!! I’m still glowing from that morning! Thanks for loaning me “Sunrise Sally” for her virgin flight & for the encouragement & launch assistance x 2 Thom. She was awesome & I know she’ll be good to you too. She is named now whether you like it or not. Actually, the Aloha from all the pilots here has been much appreciated. Thanks to Jim for in-flight advice & a fun time at lunch also. P.S....I ‘might’ give her back eventually, but me & Sunrise Sally have a “thing” now. Thanks for the great story Thom! I enjoyed your article very much and am excited about your new wing. Good luck getting that beauty back from Reese...It sounds like it was an amazing day for all. Pleas continue to post articles for those of us living vicariously through the written word.